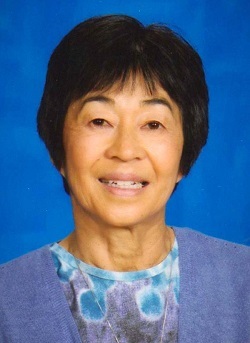 ister Makiko Fujiwara was born Patricia to John and Makiko Fujiwara in Spokane. When she was three, her extended family, now including her younger sister Diane, returned to their roots in Seattle. Living in the Rainier Valley, she attended St. Edward School and went on to Holy Names Academy. By then, her youngest sister, Theresa, was born. “My family and Japanese American heritage are foundation for all that I have been able to be and do. I’m forever grateful to my family, especially my wonderful parents,” she says. At Holy Names Academy she greatly admired the Sisters for their sense of service, kindness, and joy. Although she strongly resisted at first, she entered the novitiate at Marylhurst in 1963. There she met some of her life-long friends. She believes that community life and sharing common goals with other Holy Names brings her hope and strength each day. After graduating from Fort Wright College, she taught primary grades at St. Aloysius, Spokane, and St. Mary’s, Seattle. Moving into parish ministry, she spent seven years at St. James Cathedral, Seattle, as Minister for Families and Children. Her interest in working with Spanish speaking led her to enroll in a master’s program in pastoral ministry through Boston College, with one year in San Antonio. After completion she served as Religious Education Coordinator in Sunnyside, Washington. Her time there was cut short as she accepted to serve on the Washington leadership team for the Sisters. Coming full circle, she taught kindergarten and second grade at St. Edward’s for 13 years before retiring from full-time teaching. She continues to volunteer at the school and feels fortunate to be part of that community.